Prof. Dr. Natalia Futekova – managing partner of the software company erp.bg and founder of ERP Academy, participated as a representative of the Bulgarian Association of Information Technologies (BAIT) in a discussion entitled “How Does Business Support Bulgarian Higher Education?”, organized by Foundation “Support for Education”, a partner of which was the Ministry of Education. “Let’s work together. We do not need to divide and fight, we live in a country, we are interested in things happening. It is up to us to create a good economic environment and to keep young people in Bulgaria. We have to go in one direction, there is where to go and what to do – let’s start doing it”, was the message of Natalia Futekova during the discussion. 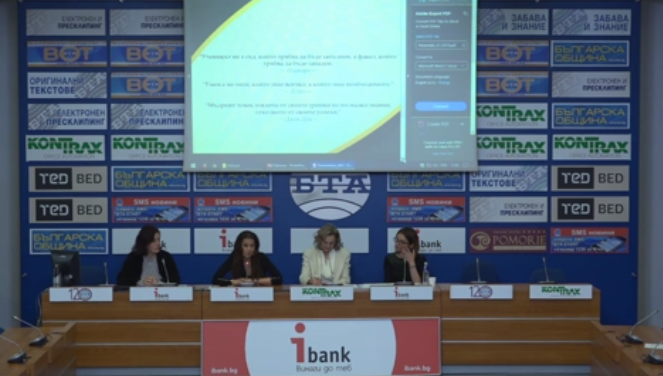 The purpose of the event was to offer solutions for interaction between business organizations and Bulgarian state universities, as well as to support the dialogue between all interested parties in this respect. “In IT companies we are used to training our employees because universities do not prepare them well enough. ERP systems are a very complex and heavy matter, a lot of practice is needed to become an expert in the industry. In our country, the focus is on developers, but in fact, there is a whole sector left – the business analysts and economically-knowledgeable people who implement and maintain these systems, the hunger for them is extremely great”, said Natalia Futekova. Four years ago, Prof. Dr. Futekova unites companies in the business software industry who are joining ERP Academy with the idea of ​​introducing a practical focus in education and training professionals to develop in ERP solutions. Today, business is looking for people who understand and use innovative technologies to increase the efficiency and competitiveness of their company. Achieving strategic business goals is virtually impossible without the widespread use of information technology as they provide the environment for today’s business. More and more companies are introducing different business software classes, and the industry is experiencing a growing shortage of staff involved in selling such solutions, project management, integration with existing customer systems, and future development and support. “When we founded the ERP Academy, many universities contacted us to ask for assistance. We send lecturers, give materials, and donate software. A very big problem is that when we make donations we pay taxes – ERP systems are worth about 100,000 lv. on which we pay VAT when we want to help a university. Another not less important point is that in order to be taught at a Bulgarian university it is necessary to have a scientific degree and the teachers often have no practical experience. In Bulgaria, to teach people from business, as is practice in the West, they need to be invited, and often in state universities they refuse to do this”, said Prof. Futekova. In the discussion on the topic “How business supports Bulgarian higher education” took part all stakeholders in the education – business – representatives of the heads of state higher education institutions in the country, university career centers, university lecturers, experts responsible for higher education, employers’ and branch organizations, companies, students. Greetings to the audience was made by Mrs. Rozalina Kozleva – a president of the Support for Education Foundation, Prof. Lyuben Totev, President of the Council of Rectors of the Higher Schools in the Republic of Bulgaria and Rector of the University of Mining and Geology “St. Ivan Rilski “and Dr. Ivana Radonova, State Expert at Higher Education Directorate, Ministry of Education and Science. Prof. Dr. Natalia Futekova starts in 39: 40min.